Indipendent 4x now is taking pre orders for the Aussie lockers for the VX! Both front (10 bolt) and rear (12 bolt) are to be available! Here is a LINK to the release info on 4x wire. Does anyone know if these will weird out TOD if your wheels slip while your on pavement? What does a Locker do? It makes the wheels on an axle spin true to each other. An open differential will allow a wheel to spin free, whichever wheel has less traction gets the power. a locked differential you can have a wheel up in the air and the one on the ground will still get power. 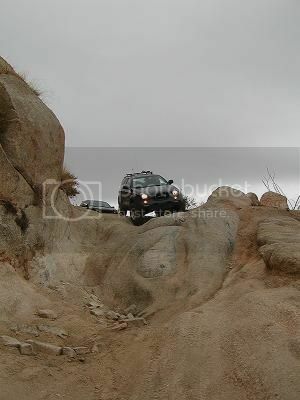 It is for someone who ventures offroad or has too much power and needs more traction. With that being said I can't wait for the rear to come out! Automatic locker? So does that eman always on and you have to do the hub to turn off and on. I have seen some that have switches that you can switch on and off and seen someone on the forums have it. While I do find this exciting, I prefer a manual locker. I like the choice of having it full on or full off. Sold the VX 11-21-07. It was fun while I had it! 1. We are looking at a limited production of two lockers: front for 10-bolt axle - most of the Isuzus 1987-2004, and rear for Isuzu corporate 12-bolt axle found in all Troopers from late 1987-1997, Amigos and pickups through 1994, and all Vehicross models. What it means is that with one turn of the knob you can lock and unlock the diff from 2x4 to 4x4 almost instantly. Without the hubs the locker keeps the diff distributing the power to both wheels evenly, which means that if you lift one tire of the ground, the other will have enough power to pull you through. Essentially you want to be in 2x4 while driving on the pavement. Having so much power in front wheels may not be too healthy for the truck, and requires serious adjustment of you driving habits. 4. Front locker and TOD are not meant to work together, so if you make a decision to install the locker you need to remember that. The best solution would be to disconnect TOD, but not everyone wants to do that. You absolutely need the hubs then. TOD will not freak out as much if the front wheels are disconnected. You will see TOD trying to kick in in extreme conditions, just as I saw it when I run through mountains in Colorado, but most of it was the power distribution from the engine. Not much of an issue, since the truck was in 2x4, and the front wheels were not catching it. 5. VXes have limited slip in the back which means you do not need the locker in the rear if you are not an extreme wheeler. A few clicks on the e-brake will immobilize the rear wheels enough to aid the front locker to pull you through the obstacles. 6. Lockers are NOT for everyone. Unless you are thinking about serious wheeling the vx there is no reason to install a locker. Manual or automatic, locker means you will take the rig on the trails where body damage is inevitable. Make sure you are ready to take some harder trails, before you splurge on the locker. Aussie lockers are similar to Lock-right and No Slip lockers. They are an automatic type - sort of a misnomer as the automatic function is random at best. This is actuated through springs which separate the "teeth" of the locker into an unlocked state with a lack of torque. From experience, that simply doesnt happen often. Therefore, you drop one of these types of lockers in (aka Lunchbox lockers), and you have a predominately (locked more often than not: 90/10 split at best) locked axle. For the rear, this is no worries. The front, well is will make turning on tight radius, slickrock, other high traction areas difficult at best. Hubs are a must, and unlocking a hub to make one of those turns will help, but not a cure all. And how often are you going to get out and turn the hub in and out? Can you say obnoxious? If you can live with that, more power to you. Really, for a front axle, a selectable locker is key, and for the 10 bolt, only one option exists. ARB. And I also would consider that if you go the ARB route, you are going to have to plumb for airlines, why not do the rear as well? The ARB exists for the 12 bolt also. I think the Aussie route is good, and substantially less expensive, but you will have some trade offs. Realize this: everyone I have talked to that had a lunchbox locker in the front has hated it, regardless of vehicle make. They are a total PITA. I was very much considering the Aussie for my Amigo and after much thought, decided against it for those reasons stated above. Sure, I would love a front locker, but because of a unique axle issue with the carrier in my truck, I need to go through a lot of hoops to get it fitted. I have only needed a front locker a handful of times over the past 7 years, so I think I will just stay how I am with the rear locker only. If going to lock the front - Highly consider if the trade off is worth it, my $$$ is on the ARB to be installed. If going to lock both - I would probably go ARB and plumb the air source to both axles, utilizing the kevlar/steel braided lines. Another thing to consider with lockers in general is that to put them in your are going to have to screw around with your third members which for the front at least can be a nightmare and that is putting it lightly. Now would be a great time to re-gear your differential lower since you: 1)Have it out, and 2)Have it apart, 3)Are probably running bigger offroad tires anyway, and most importantly: 4)Don't want to have to screw with this stuff again . I have the Aussie front lockers and didn't put them in yet, even when I had all my front end apart because I am planning on going to 4.77s if and when I ever find some, and taking the third member apart twice didn't really appeal to me. I don't know if I'm comfortable screwing with my third member. lunchbox locker = simple (garage install, DIY). You do not need to adjust things like backlash, and other gearing (ring & pinion) meshings. The lunchbox lockers simply drop inside the carrier, replacing the spider gears. ARB = shop install, unles you are adventurous enough to tackle the meshing, backlash, etc. Those types of lockers replace the carrier. That is the difference in a nutshell. When I do mine I will be going with the Aussie in the rear. But I agree, a selectable in the front is much better. Since I will be running a D44 in front when I do my SAS I plan on using an OX locker. Cable actuated, so I don't have to worry about electronics or air failures! Also I will hopefull be able to find some 5.38's for gearing. Billy, did you order the rear gears from Indy yet? It is all too easy to find 5.38's for the D44.